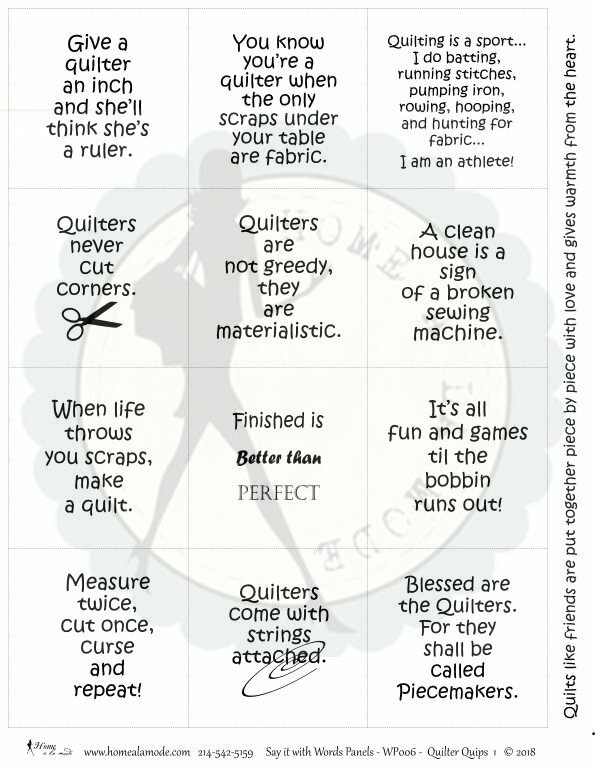 Say it with words… QUILTER’S QUIPS is a Home a la mode word panel that is all about QUILTERS AND THEIR FUN WITH QUILTING... like: Give a quilter an inch and she’ll think she’s a ruler. - You know you’re a quilter when the only scraps under your table are fabric. - Quilting is a sport... I do batting, running stitches, pumping iron, rowing, hooping, and hunting for fabric... I am an athlete! - Quilters never cut corners. - Quilters are not greedy, they are materialistic. - A clean house is a sign of a broken sewing machine. - When life throws you scraps, make a quilt. - Finished is Better than Perfect - It’s all fun and games til the bobbin runs out! - Measure twice, cut once, curse and repeat! - Quilters come with strings attached. - Blessed are the Quilters. For they shall be called Piecemakers. - Quilts like friends are put together piece by piece with love and gives warmth from the heart. FUN STUFF!! !